Adult scoliosis diagnosis requires exam and often X-rays. Various treatment options are available. This includes an interview with a doctor and a review of the patient's medical records. These are done in order to determine the presence any medical conditions that may be causing the spine curvature. A portion of the exam may be done while the patient is bending forward as this position makes it easier to visualize certain irregularities. Adult patients with abnormal spinal curves, unusual back pain, or signs of underlying medical conditions will need imaging studies. 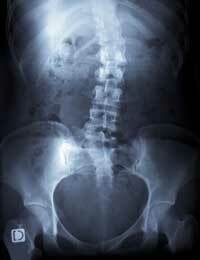 These may include X-rays, CT scans, or an MRI of the spine, as well as the pelvis and hips. Which of these imaging studies will depend on what conditions are suspected to be involved in causing the scoliosis. The standard method for assessing the curve is to measure the amount (angle) of the curve. This is technically called the Cobb angle. This measurement is determined from an X-ray of the spine. Many adult patients with very mild spinal curves (especially those with idiopathic scoliosis) do not need treatment. However, they should be monitored on a regular basis. Adult scoliosis treatment involves both surgical and non-surgical options. For adults with smaller curves, generally 20 degrees or less, observation may be the course of treatment. Patients are monitored and re-examined regularly, and have X-rays taken approximately every 5 years. Although bracing can be effective for adolescent patients, it is not effective for preventing curve progression in adults. Even though their use is rare in skeletally mature patients, a brace may be worn to provide some pain relief. There are several different types of braces available. Physical therapy is often used as part of an adult scoliosis treatment plan. The goal of physical therapy is strengthening (especially core strengthening), improving flexibility and symptom relief. Injections may provide temporary relief for persistent back and/or leg pain. There are several types of injections that can be done like epidurals, nerve blocks or facet injections; a pain management physician often performs these. Sometimes non-surgical treatments fail to work or are not an option and, therefore, surgery is required. The goal of adult scoliosis surgery is to correct the curve as much as possible, stabilize the spine and reduce pain. Adult scoliosis surgery often includes the implantation of hardware (screws and rods) and a spinal fusion. There are different ways to perform adult scoliosis surgery. It is understandable that patients may want to avoid surgery; however, if left untreated, a curve that progresses can eventually adversely affect heart and lung function, as well as lead to chronic pain. Adult scoliosis surgery is riskier than scoliosis surgery in younger patients, the complication rate is higher and the recovery time longer. However, adult patients can experience significant functional improvement with surgery. According to the Scoliosis Research Society: "Alternative treatments such as chiropractic medicine, physical therapy, yoga, etc. have not demonstrated any scientific value in the treatment of scoliosis. However, these and other methods can be utilized if they provide some physical benefit. These should not, however, be utilized to formally treat the curvature in hopes of improving the scoliosis."